New detailed employment numbers released Thursday show an uptick in hiring last year among Wisconsin's private sector employers, but the state still fell well short of the jobs benchmark Gov. Scott Walker set during his 2010 campaign. 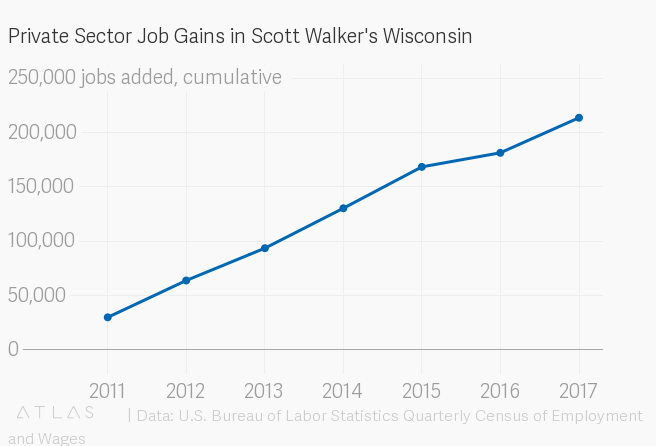 The data from the federal Bureau of Labor Statistics show Wisconsin added 213,426 private sector jobs during Walker's first seven years in office, well shy of the 250,000 jobs the governor promised to create by the end of his first four-year term. At the same time, the numbers show Wisconsin added private sector jobs faster than all of its Midwest neighbors in 2017, ranking 26th in the nation in private sector job growth last year. The numbers come from the BLS Quarterly Census of Employment and Wages, or QCEW, which economists regard as the "gold standard" of job metrics. From 2011 to 2017, private sector jobs grew by 9.4 percent in Wisconsin, which ranked 34th in the nation. By comparison, over the same seven-year span, Michigan ranked 15th with a growth rate of 16.2 percent, Minnesota ranked 22nd at 12.7 percent, Illinois ranked 33rd, just slightly ahead of Wisconsin. Only Iowa trailed Wisconsin among its Midwest neighbors, with a growth rate of 8.1 percent, ranking 39th. Wisconsin trailed the nation as a whole from 2011 to 2017. The United States added private sector jobs at a rate of about 15 percent. Wisconsin added 32,259 private sector jobs in 2017, for a growth rate of 1.3 percent, which was 26th in the nation. That topped Minnesota (1.2 percent), Illinois (1.0 percent), Michigan (1.0 percent), and Iowa (0.5 percent). But it trailed the national economy, which added private sector jobs at a rate of 1.7 percent in 2017. The data released Thursday put Wisconsin in the middle of the pack in terms of manufacturing jobs, both in 2017 and over the entirety of the Walker administration. Walker has emphasized manufacturing in the state's economic policy, signing a manufacturing and agriculture tax credit as part of his first budget. The credit now reduces business taxes by roughly $250 million annually and is expected to cost state government a total of $1.3 billion by the end of this two-year-budget cycle. From 2011 to 2017, Wisconsin ranked 24th in the nation in private manufacturing job growth, which increased by a total of 34,730 jobs, or about eight percent. Michigan (26.7 percent) and Minnesota (8.76 percent) grew manufacturing jobs faster from 2011 to 2017, while Iowa (7.8 percent) and Illinois (2.2 percent) trailed Wisconsin. In 2017, Wisconsin ranked 27th in manufacturing job growth, with a growth rate of about 1.7 percent. In 2017, Wisconsin's average weekly wage was $908, up from $884 in 2016. That ranked 28th in the nation. 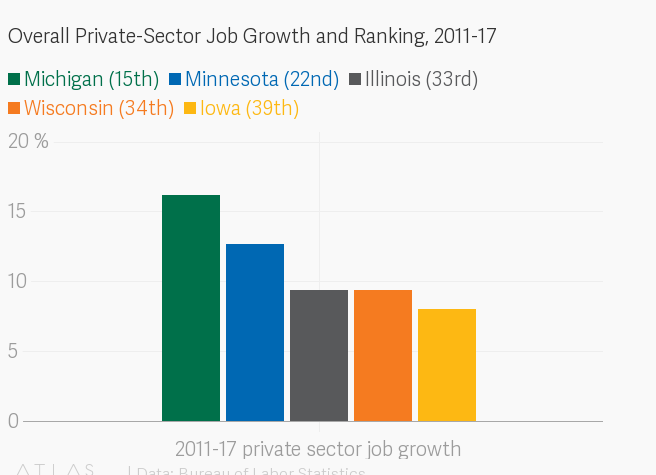 Average private sector weekly wages in Illinois ($1,123), Minnesota ($1,090) and Michigan ($1,006) outpaced Wisconsin, while wages in Iowa ($876) trailed behind. The average weekly private sector wage nationwide was $1,064 in 2017 according to the BLS. When BLS data covering all employers came out in May, it showed Minnesota for the first time passing Wisconsin in the total number of jobs, though just barely. But when both states' private sector workforces are compared, Wisconsin still has an edge, albeit a small one. Wisconsin had 6,265 more private sector jobs than Minnesota after a relatively strong 2017. When public sector jobs are added to the mix, Minnesota has 3,096 more jobs than Wisconsin. The job totals are noteworthy because Wisconsin's population is still roughly 219,000 larger than Minnesota's. Democrats said the numbers showed Walker had failed on the promise that was the centerpiece of his first campaign. They also said Wisconsin would have far exceeded Walker's 250,000 job goal if it had kept pace with the rate of hiring in the rest of the nation. "Gov. Scott Walker's economic policies have caused Wisconsin to trail far below the average job growth in the United States coming out of the recession, because his economic priority has been taking money away from roads and education so he can give billions to corporations and his wealthy donors," said Wisconsin Democratic Party Spokeswoman Melanie Conklin. "To grow Wisconsin jobs and wages we need a Democratic governor who will invest in Wisconsin businesses, roads and schools instead." Walker's office has highlighted the state's low unemployment rate, which is among the best in the nation. "More people are employed in Wisconsin today than ever before, wages are up, and our unemployment rate is 2.8 percent, the best in state history," said Walker Press Secretary Amy Hasenberg. "Wisconsin is positioned to win the 21st century under Governor Walker’s leadership." The unemployment rate is calculated from a different set of numbers based on a monthly survey of Wisconsin households. It measures the percentage of people who are actively looking for jobs but don't have them. Walker said last year that he had "shifted" from focusing on the 250,000 jobs promise, saying his number one priority now was getting more people trained to meet the state's workforce needs. Editor's note: WisContext associate editor Scott Gordon contributed the data visualizations for this story.